If you’re not on our mailing list you’ll have missed our monthly playlists, highlighting some of the sounds coming from our office and the artists performing at forthcoming Capsule events. 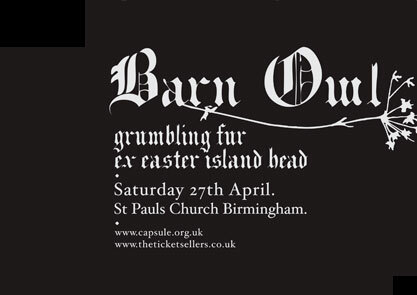 March’s playlist featured Demdike Stare, Sleaford Mods and Free School as well as Barn Owl, Ex Easter Island Head and Grumbling Fur who you can catch performing at St Paul’s Church on Saturday 27th April. Watch this space for April’s playlist, or sign up to mailing list – there’s a link on the homepage.